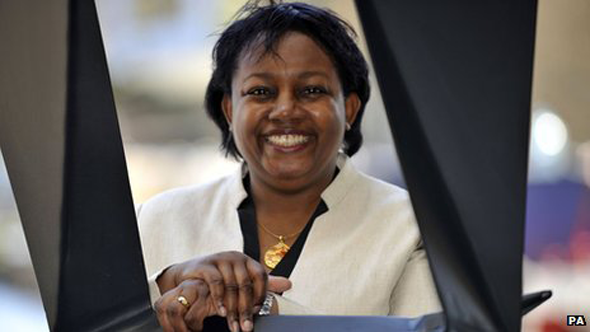 Children's author Malorie Blackman has been named at the top of a list of the UK's most influential black figures. Blackman, who is the current Children's Laureate, topped publishing company Powerful Media's annual Powerlist. The author was followed in the top five by merchant banker Ken Olisa, barrister Matthew Ryder, athlete Mo Farah and media agency boss Karen Blackett. Blackman said: "Highlighting so many black people in such diverse different spheres is such an inspiring thing." She continued: "It challenges stereotypes and shows that many people are achieving great things. It's a fantastic showcase of the amazing success stories that often go unreported." She has now written more than 60 books for children and teenagers, including Noughts and Crosses, Pig-Heart Boy, Hacker and Cloud-Busting. She was made Children's Laureate in June. At number two on the list, Ken Olisa runs merchant bank Restoration Partners and is a non-executive director at Thomson Reuters. A library at Fitzgerald College, Cambridge, was recently named after Olisa after he made a £2m donation. The names were chosen by a five-person panel headed by management consultant Vivian Hunt and including Thomson Reuters executive Olakunle Babarinde. The Powerlist is sponsored by Thomson Reuters and Lloyds Bank. A spokesman for the Powerlist said the panel was independent and the rankings decided on merit.